Foreign Minister Shah Mehmood Qureshi on 28 August stated that it is time to “move on”, the foreign minister said Pakistan will try to steer its bilateral relations with the US towards betterment during the US secretary of state’s visit to Islamabad on September 5. There is nothing new in the approach of the PTI government. It is the habit of the political and military leadership to promote an impression that they will uphold national interests at all costs, whilst engaging with the United States. If this had been true then the political and military leadership of Pakistan would abandon alliance with the US. This alliance is maintained despite the complete disregard by the US of Pakistan’s security concerns. The US opened the doors of Afghanistan for India and is still persisting on this policy, asking India to help her keep an eye on Pakistan. Yet, the political and military leadership of Pakistan continues supporting the US political and military efforts to consolidate her occupation in Afghanistan. The Bajwa-Imran regime is fully supporting the US plan to normalize relationships with India so that Pakistan is no longer an obstacle to India’s rise as the dominant regional power and guarantor for US interests. What has been described as the “Bajwa Doctrine” is not about saying ‘no more’ to US demands for ‘do more.’ Instead the doctrine is about crushing whatever resistance has been left in Pakistan, against US occupation as well as Indian aggression. Pakistan’s political and military leadership tries to conceal its treachery behind the vague notion of national interest, which is used to secure US foreign policy objectives. In reality it does not care about the interests of Pakistan, even if it is upon the basis of nationalism. A sincere Islamic leadership cares about the interest of Islam and Muslims, not so-called “national interest.” A sincere leadership would have not made alliance with the US in the first place. Instead, a sincere leadership would have supported the Afghan Muslim brothers against the US aggression and occupation, forcing the US into a complete humiliating withdrawal from our region. A sincere leadership would not exercise restraint in front of relentless Indian aggression and would work to end its oppression in Occupied Kashmir by fully supporting the mujahideen there. Pakistan is the strongest Muslim country in terms of resources and we will thrive after escaping the trap of the US alliance, if we re-establish the Khilafah on the Method of Prophethood, which secures interests solely on the basis of Islam. Allah (swt) said, يَا أَيُّهَا الَّذِينَ آمَنُوا لَا تَتَّخِذُوا عَدُوِّي وَعَدُوَّكُمْ أَوْلِيَاء “O you who believe! Take not My enemies and your enemies (i.e. disbelievers and polytheists, etc.) as friends” [Surah Al-Mumtahina 60:1]. Tehreek-i-Labbaik Pakistan (TLP) said on 29 August 2018 that its march on Islamabad — a form of protest against Dutch Freedom Party leader Geert Wilders’ announcement to hold a competition of blasphemous caricatures — will commence as planned unless Netherlands’ ambassador to Pakistan is expelled from the country. The Dutch endorsement of freedom of expression has led to regular defamation of the Prophethood. Netherlands is a small state of 17 million, yet its citizens are able to publicly attack the belief of 1.8 billion Muslims, who are nearly a quarter of the world’s population. Historically, its Dutch East India Company established colonies throughout Muslim Lands and its crusader hatred towards Islam remains within its population. The Netherlands is clearly belligerently hostile and there is no question of diplomatic relations with the Netherlands of any kind. Pakistan’s ambassador to The Hague must be recalled and the Netherlands’ ambassador expelled. However, that would just be the start. It is upon the Muslims to work earnestly for the re-establishment of the ruling by all that Allah (swt) revealed, so that none dare defame RasulAllah ﷺ. Nothing less than the Khilafah (Caliphate) on the Method of the Prophethood will ensure that Islam is held with respect in the entire world and contemplated upon with seriousness. 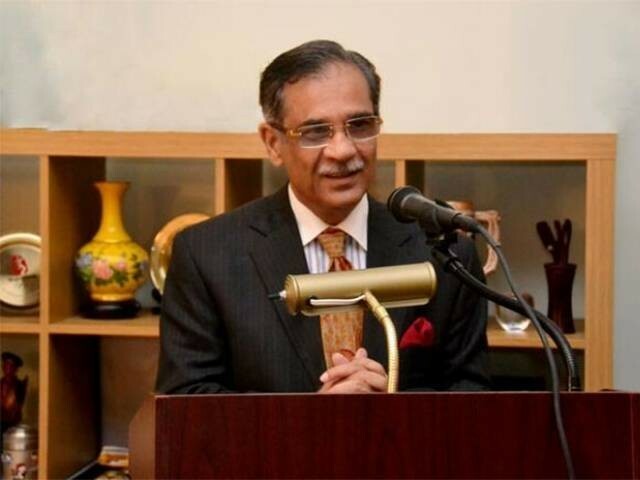 The Chief Justice of Pakistan Justice Saqib Nisar said on Wednesday, 29th August 2018, that people have to say that having many children is not a good action. He said that change is not occurring with regards to the population and the government must present solution. He commented in this way whilst hearing a suo moto case regarding population control. It is Western secular thinking that too many children are a burden on a family and ultimately on the nation as well, on the basis that resources are not enough to fulfill the needs of a large population. Due to this thinking, Western nations, and other industrialized countries like Japan and South Korea, encourage their population to practice birth control or family planning. With regards to family planning, China has been a leading country which officially forced her population on a one child policy since 1979. However, for the last decade, Western nations as well as the industrialized nations of the East have begun to experience the negative effects of population control on the economy and other societal arenas. They don’t have enough young people to work and take on various societal responsibilities, including taking care of the elders. So now many Western countries encourage their citizens to have babies and grant economic concessions for. As for China, it terminated its one child policy in 2013, when it was not uncommon for a single child to support its parents and both sets of grandparents, in a visibly aging population. It is unfortunate that the Chief Justice of Pakistan is following the thinking of Western Kafir nations instead of following the commands of Allah (swt). Allah (swt) has assured the whole humanity that He (swt) has secured the Rizq (sustenance) of each and every soul. Allah (swt) said, إنًّ ٱللًّهَ يَرْزُقُ مَن يَشَآءُ بِغَيْرِ حِسَابٍ “Verily Allah provides sustenance to whom He wills without measure.” [Ale Imran 3: 37]. And Allah (swt) warned us of killing our children because of the fear of poverty that we would not be able to provide them sustenance. Allah (swt) said, وَلاَ تَقْتُلُوۤاْ أَوْلادَكُمْ خَشْيَةَ إِمْلاقٍ نَّحْنُ نَرْزُقُهُمْ وَإِيَّاكُم إنَّ قَتْلَهُمْ كَانَ خِطْئاً كَبِيراً “And do not kill your children for fear of poverty. We provide for them and for you. Indeed, their killing is ever a great sin”. [Al-Isra’ 17:31]. Poverty is not because of lack of resources. It is because of the capitalist man made system which accumulates wealth in the hands of the few. So in order to end poverty, we should not focus on population control. Instead we must focus on abolishing the capitalist system and re-establishing the Khilafah (Caliphate) on the Method of Prophethood. The implementation of Islam ensures the distribution of wealth in a society, eradicating poverty as a consequence. Next PostWill Trump be removed as President?